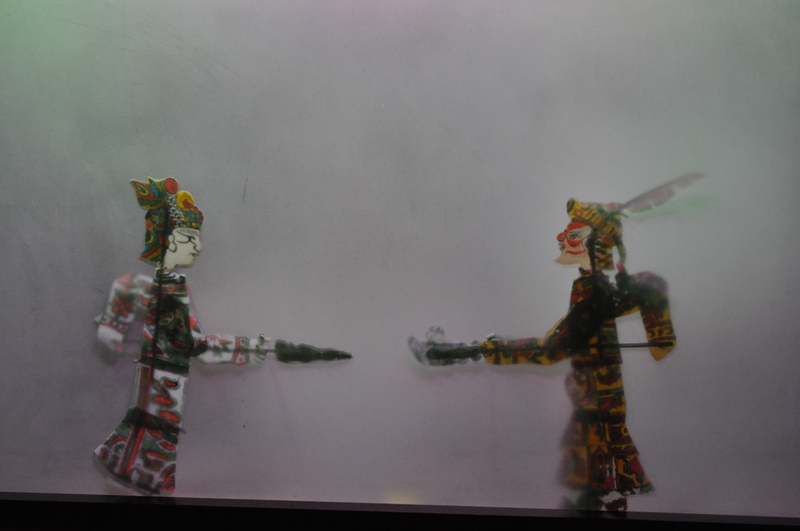 The particular narrative depicted in the video of the Qibao Shadow Play tells the story of the famous General Yang and his family. The play takes place within the Song Dynasty (960-1279 A.D.), during which time the Song Empire was suffering from the invasion of the Liao from the northern part of the country. In order to protect the Song Dynasty border form invasion, the men of the Yang family work as generals and soldiers. The loyalty of the men in the Yang family to the Song Dynasty led to many deaths during this war. The protagonists of the play include the only son of the Yang family, General Yang Zhongbao and his wife Mu Guiying, who bravely decided to fight the Liao army alongside her husband. In order to protect the Song Dynasty, they received the imperial edict from the Song Empire to fight the Liao army. The Liao army contained many more soldiers than remained in the army of the Song Empire. Tianmen Zhen, an extremely powerful military figure within the Liao army, was arranged by the General of Liao to fight against the Yang couple. After various battle scenes, General Yang and his wife defeat Tiananmen Zhen and the Liao army and are able to protect the Song Dynasty border. 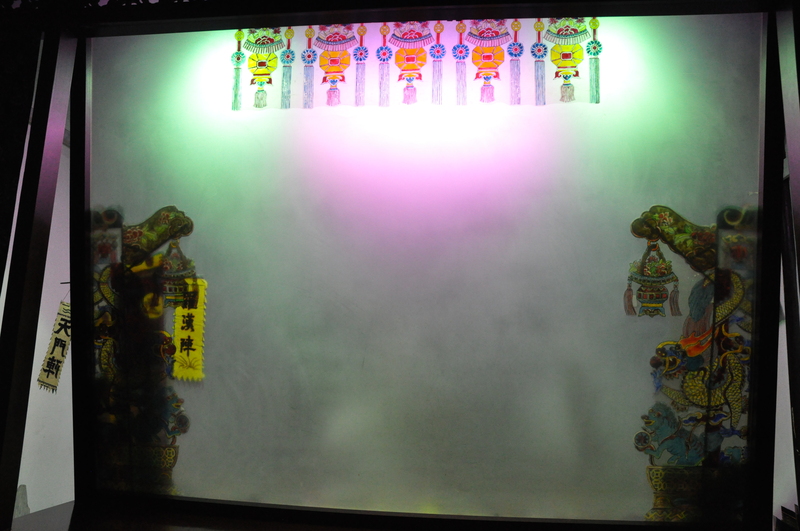 Traditionally, Chinese Shadow puppets are made of thin, translucent animal skins that are dyed in order to create bright colors. The dye also acts as a preservative to prevent decay. While the types of skin used for the puppets depend on the availability of animals within a particular community, goatskin and sheepskin are traditionally the most popular. 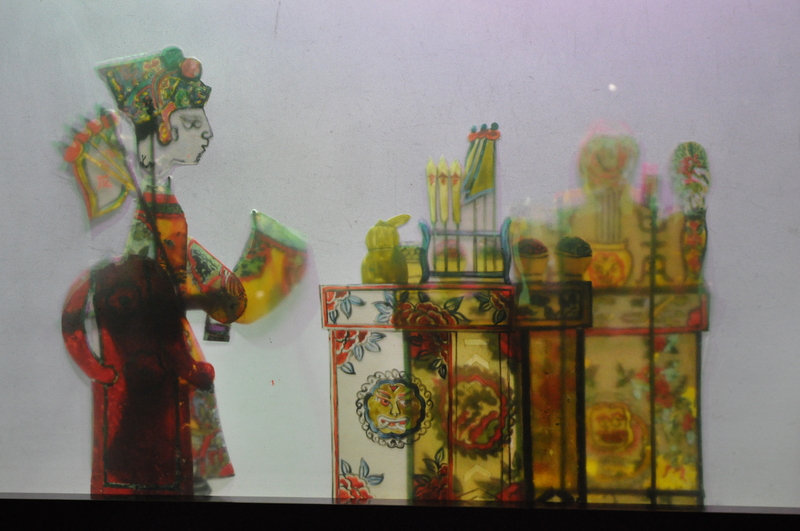 Today, other materials can be used to make the puppets, such as plastic or a thick transparent paper. 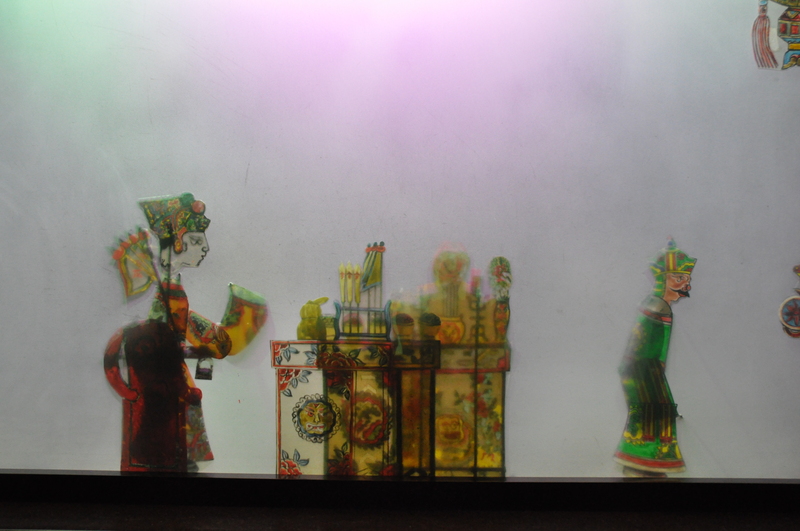 The puppets are meticulously carved into shapes of human figures, animals, or scenery and manipulated with rods in front of a light source, projecting bright colorful shadow images onto a semi-transparent screen. 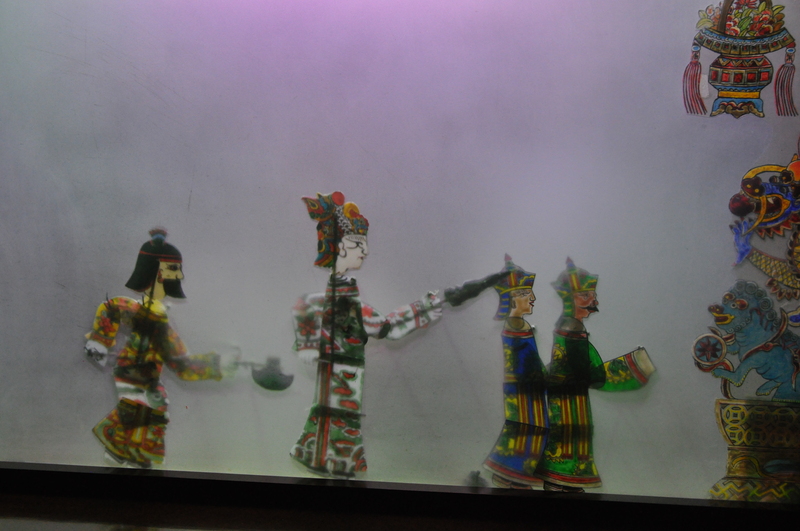 Qibao puppet masters and their apprentices make their own puppets, as is the tradition. Human figures are composed of four separate parts: a body, a head, arms and legs. These pieces are connected and articulated with knots of string that connect each joint in the arms and legs. Long rods are attached to the ends of arms and legs in order to create movement. These rods are typically made of bamboo and connected to the figures with either string or wire. The control rod allows the manipulator to hold the figure upright and move the puppet in different directions, while separate handles are connected to the limbs. Basically, the control rod is the main handle for the puppets and is the primary means through which the shadow puppets are moved. Many human shadow puppets have detachable heads, which allows for interchangeability of characters. 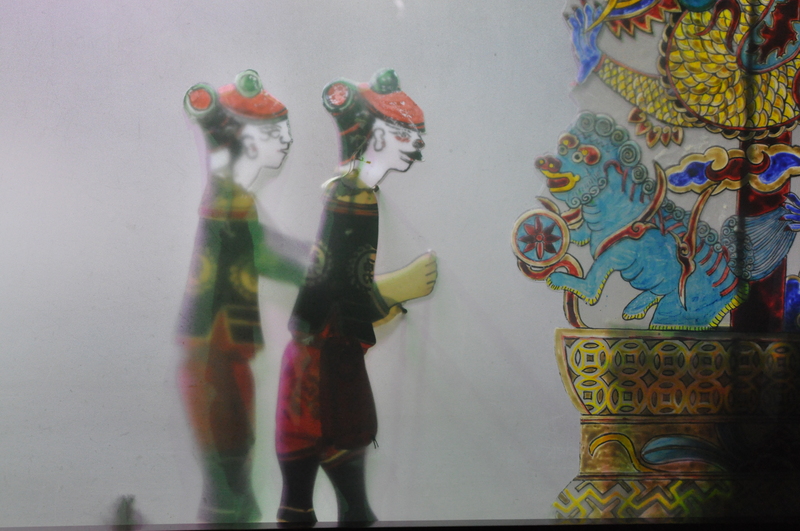 Animal puppets are as important to the tradition of Qibao Shadow Play as the human puppets. Unlike human figures, which follow a distinct formula for manufacture, each animal created is unique. Small animals have one control rod to convey a specific movement, while larger animals are much more complex. Animals such as the crane in Video 2 have complex and multiple joints to portray flowing, precise movements. While the movements of human figures are conventionalized, the animals promote a more playful type of motion. The manipulator must observe and copy how an animal would move in nature, and communicate the nature of the animal through unique movements and behaviors to the audience on the other side of the screen. The crane in Video 2 from Qibao, for example, has a long neck composed of several joints that allow accurate and meticulous motion. 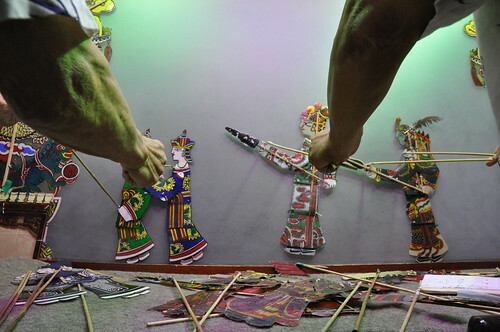 Human puppets can represent a wide range of social status and personality traits through the rendering of the heads and ornamentation of the bodies. 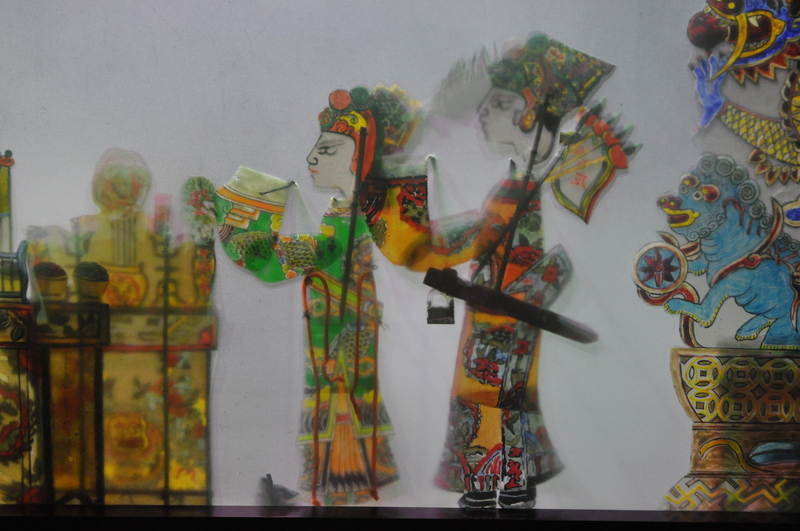 The characters within Chinese Shadow Play are divided into four groups. The first of these groups includes the Chou, which is composed of male or female comic actors. The second group is known as the Jing and includes male military characters. The Sheng is the third group, and is made up of scholars and officials. The last group, called the Dan, includes all women characters, whether they are military, educated, servants, old, or young. Painted faces and headdresses distinguish the personality traits, social ranking, and type of characters. For example, a violent general might wear red and black on the face and body: the red designating strength and black loyalty. A high status female or princess may have an elegantly painted face and elaborate dress. 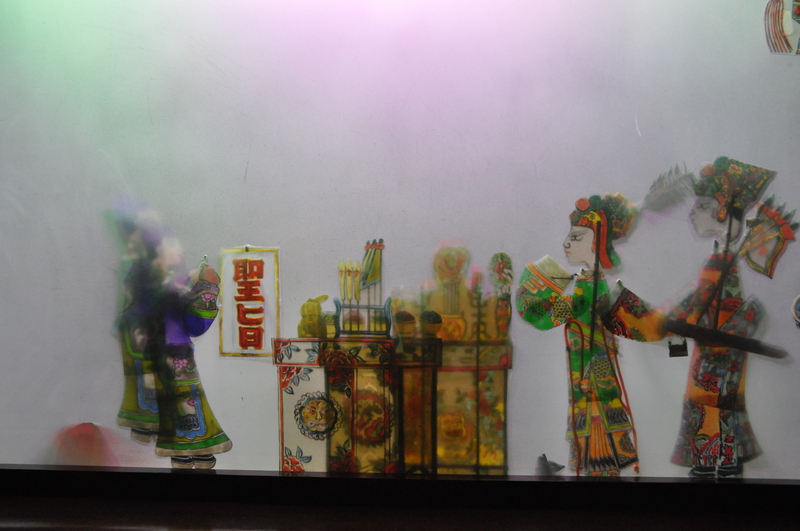 Apart from the use of color and aesthetic decoration of the puppets, the way in which they are cut also helps reflect the personalities and identities of characters. Characters of noble status have faces that are cut with extreme precision, leaving elegant contour lines that distinguish facial features. On the other hand, comics, warriors, and mythological characters often will have faces that are left more solid and painted. Basically the more ornate and detailed the painting and carving, the more important the character. Important or wealthy characters often have embellished and colorful bodies with precise cutouts, while less important or lower class characters will have plainly painted, uncarved bodies. 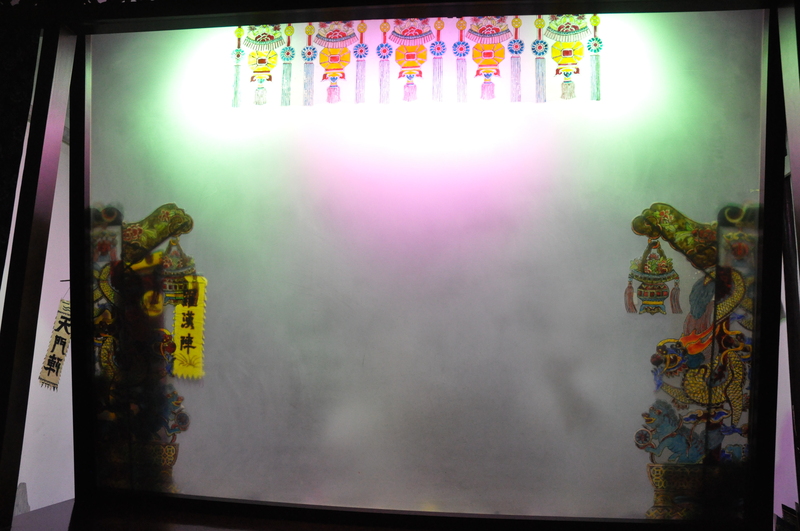 It is important to note that the symbols seen within the puppets are traditional and therefore easily recognized by a Chinese audience who would be familiar with such imagery. Animal puppets also have symbolic purposes. In Chinese culture, the Tiger represents dignity, ferocity, and courage, while the Dragon represents male vigor, fertility, prosperity, and good fortune. The Dragon is also often used as a symbol for the Emperor. Some animals symbolize different notions depending on how they are behaving or how they are depicted. The previously mentioned crane, for instance, represents wisdom and nobility if it is flying among clouds, marriage if there is a pair, and determination, power, and wealth if it is among pine trees.